Washington's second inauguration, 4 March 1793, was a simple affair, particularly in contrast with his first. Acting on the advice of his cabinet, whose opinion on the ceremony attending his swearing-in he had asked for, Washington rode alone in his coach to the Senate chamber, where he took the oath of office and delivered his second inaugural address. Its brevity (it consisted of only two short paragraphs) and its stern and self-righteous tone perhaps reflected his chagrin at being obliged to remain in office for another four years. Washington then took the presidential oath and without fanfare promptly returned to the executive mansion. His misgivings and forebodings about his second term were not misplaced. Within a few weeks of his inauguration it seemed that the United States was inexorably being drawn into the conflict sparked in Europe by the French Revolution. Some three months earlier, disturbing news of developments in France during the summer of 1792 had reached the State Department—the defeat of French armies that had led to mass Jacobin demonstrations in Paris, including the storming of the Tuileries; the imprisonment of the king; and the suspension of the constitution and establishment of a revolutionary government, all followed by the revival of French military successes. Then during the weeks following the onset of Washington's second term came yet more ominous news—Louis XVI had been guillotined, the Girondin party had gained power, France had declared war on Great Britain and Spain, a great European coalition was being formed to resist the Revolution, and a new minister plenipotentiary of the French republic was being sent to the United States. President Washington is depicted with his cabinet in this Currier and Ives lithograph. human blood and expressed his willingness to see "half the earth desolated" if that were necessary for the triumph of human freedom. Washington emphatically disagreed. Studiedly impartial, he deplored the pro-French sentiment that prevailed among so many of his countrymen. His ardent wish, as he had written in 1790, was for America to be "unentangled in the crooked politics of Europe." Neither was he enthusiastic about the Reign of Terror and the concomitant bloodbath. He rather believed that "cool reason" alone could "establish a permanent and equal government" and deplored the fact that such dispassion "is as little to be expected in the tumults of popular commotion as an attention to the liberties of the people is to be expected in the dark divan of a despotic tyrant." The grave threat that the war in Europe posed to American sovereignty must, he believed, be safeguarded by a policy of neutrality. But in view of the Franco-American Revolutionary War treaties, how could such a policy be pursued? By the terms of those treaties the United States had promised to come to the aid of France if that nation became involved in a war; its prizes (but not those of its enemies) might be brought into United States ports, and its West Indian possessions were guaranteed. Was not the sacrifice of national honor the price of reneging on commitments made to America's ally? Was not England's enmity, or even war with that nation, the inevitable consequence of meeting treaty obligations to France? Washington sought to avoid the risk of armed confrontation with England and the danger of diplomatic retaliation by France by eschewing a formal suspension of the French alliance while informally disregarding its stipulations. This was the implicit intent of his famous Proclamation of Neutrality, issued in April 1793, in which he announced his determination to pursue "a conduct friendly and impartial toward the belligerent Powers" and enjoined his countrymen against aiding either combatant. The turmoil and attendant changes in France posed for the president another and, from the standpoint of precedent, more important problem: Should the United States recognize the republic that had replaced the monarchy, with which, in theory anyway, the Franco-American treaties of alliance and commerce concluded in 1778 had been negotiated or did the overthrow of the monarchy annul those treaties? Whichever way Washington decided, important groups or interests would be alienated. If recognition were accorded the new regime, the Federalists at home and the aristocratic powers in Europe would be resentful; if recognition were denied, the Jeffersonians at home and the revolutionaries in France would be outraged. After careful deliberation, Washington directed his secretary of state to recognize the revolutionary government, arguing that "we surely cannot deny to any nation the right whereon our own government is founded, that every nation may govern itself according to whatever form it pleases." Thus was established a vitally important precedent for the chief executive's right to extend—or, by implication, to refuse—recognition to a foreign government. Washington's insistence on American aloofness from the wars of the French Revolution was perhaps his greatest accomplishment as president. Pushed in one direction by the partisans of France, shoved in another by the supporters of Great Britain, Washington believed that during the critical years of its youth as a nation the United States must remain free to grow in its own way, to continue to prosper, to consolidate, and thus to perpetuate national union. He thus steadfastly held to the belief that the diplomatic desideratum of his day was for Americans to forswear partiality for one power or the other and to pursue an unswervingly neutral policy. To do otherwise would be to court the single gravest danger confronting the new nation: foreign entanglements that might lead to United States participation in foreign wars and ultimately to the loss of its independence. The point needs to be underscored. J. A. Carroll has said that in no other "instance during his tenure as chief executive did Washington demonstrate his role in government so abundantly, or his greatness in statecraft so dramatically. In the year 1793 he forged the neutral rule in its fundamental form, and through the next four years his every policy was built on it." A severe test not only of American neutrality but also of presidential patience was provided by the reception of the new French minister, Citizen Edmond Genet. Aware that Genet would insist that America honor its treaty obligations and do whatever else it could to aid an embattled sister republic, the Washington administration was squarely confronted with the difficulty of maintaining the nation's neutrality in the face of its diplomatic vulnerability. Genet, "brash, egotistic, extravagant in his ambition," was certain that he could make the United States into "an outpost of French revolutionary sentiment and also of recrudescent French imperialism." A great number of Americans, blithely unaware of the French-man's unneutral expectations, warmly welcomed Genet as the symbol of a steadfast ally and beleaguered sister republic. Enthusiastically greeted on his leisurely tour from Charleston, South Carolina, to the nation's capital, Genet arrived in Philadelphia on 16 May 1793, hailed by a salvo of cannon and the ringing of bells. The president's treatment of the French emissary was in sharp contrast: Washington's icy manner would have frozen the enthusiasm of all but the most insensitive of diplomats. Genet was singularly obtuse. Disregarding the president's cautionary signal, the advice of sympathetic Republicans, and the laws of the United States, Genet stuck to the belief that the Americans need only hear his clarion call to rally around the standard of the French Revolution. Thus self-deceived, he pursued policies suggesting that the United States was France's satrapy rather than the nation's sovereign ally. He organized expeditions against Florida and Louisiana, outfitted and armed privateers, directed that their prizes be returned to American ports, and sought to popularize the notion that the survival of American republicanism hinged on the success of French arms. Washington was indignant and angry at Genet's flagrant abuse of his ministerial post, behavior of which the secretary of state was astonishingly indulgent. Having convinced himself that the emissary of America's close republican ally could do no wrong, Jefferson insisted on giving Genet the benefit of every doubt. But the doubts soon became irrepressible, and by early August the secretary of state was ready to join his cabinet colleagues in approving the president's decision to request Genet's recall. Until the French had time to respond, Washington was obliged to put up with Genet, whose brashness was as unbridled as before. To make sure that the president was kept informed of exactly how reckless the Frenchman was, two prominent Federalists, Senator Rufus King of New York and Chief Justice John Jay, published in a New York newspaper the following succinct accusation: "Mr. Genet, the French Minister, had said he would appeal to the people from certain decisions of the President." Far from denying the charge, Genet addressed a public letter to Washington saying that he had done just that and was prepared to do so again. Although pleased by the overwhelmingly favorable public support accorded him, Washington remained ostensibly impartial: he extended no thanks to King and Jay, much to their chagrin, and, at the request of Genet, ordered an inquiry to determine whether the French minister had been libeled. For six more months Washington continued to endure patiently Genet's uncurbed efforts to undermine the American government. Finally, early in 1794, a new French minister, Jean Antoine Joseph Baron Fauchet, arrived with orders to arrest his predecessor and send him back to France. Washington charitably granted asylum to Genet, who thus kept his head while giving his heart to one of Governor George Clinton's daughters, with whom he settled in rural New York. In the meantime, Genet's onetime patron had retired to rural Virginia. Jefferson, fed up with political abuse and squabbles, had submitted his resignation on 31 July 1793 (to become effective at the end of December) and left for Monticello a month later. Since he did not return to the capital until November, this September departure marked all but the end of his tenure as secretary of state. He was replaced by Attorney General Edmund Randolph. For Washington, Jefferson's departure would prove a major liability. Not only was the latter now free to head the political opposition to Washington's administration, but the president was also deprived of a counselor whose opinions had often been the necessary counterweight to those of the secretary of the treasury. As Flexner concluded, "The very essence of Washington's decisionmaking process was set awry. Since he endeavored, before he reached a conclusion, to balance all points of view, he found it immensely valuable to have laid before him the arguments of the ablest members of both principal factions. Now, when Hamilton spoke, there was no equally strong voice to answer." This was tellingly demonstrated by the course of Anglo-American relations during the final years of Washington's presidency. The administration scarcely had time to breathe a collective sigh of relief over the soothing of relations with France that followed the forced retirement of Genet when it was confronted with distressing evidence of a revival of England's hostility. For one thing, the British government was manifestly determined to cut off the flourishing American trade with the French Caribbean ports that followed France's decision in February 1793 to throw open its previously guarded West Indian trade to the United States. Britain's determination took the form of a number of orders-in-council that cavalierly ignored neutral—and this meant particularly American—rights. By January 1794 the British were making wholesale captures of vessels flying the flag of the United States while systematically ignoring the government's protests. Such high-handed assaults on American commerce channeled congressional energy during the winter and early spring of 1794 into a "flood of legislation aimed at war," despite the repeal in January of the most objectionable of the orders-in-council and the diminution of the indiscriminate condemnation of American vessels by British admiralty courts in the West Indies. Such minor concessions were counter-balanced by other grievances of longer standing—exclusion of American ships from British West Indian ports, retention of American fur-trading posts in the Northwest, refusal to settle the Maine boundary, unwillingness to grant compensation for slaves carried off by the British army in 1783, and the search of American ships for British deserters and their impressment on flimsy evidence. To most congressmen, Federalists and Republicans alike, the time had come for yet another successful chastisement of imperial presumption. Accordingly, on 28 March 1794 a one-month embargo (later extended) on all foreign shipping was imposed, followed by an unsuccessful effort to sequester debts due from American to British subjects. These punitive measures were accompanied by a Federalist-sponsored program of national preparedness calling for harbor fortifications, an increase in the army, and the building of warships. Although Washington shared the view that the injuries inflicted on the United States by Great Britain must be redressed, he believed that the proper policy was neither military strutting nor retaliatory measures but diplomacy. Successful negotiations, he was convinced, were the only sensible alternative to a ruinous war. To whom should they be entrusted? Could Washington have had his wish, the American negotiator would have been his most trusted adviser. But Hamilton's presumed Anglophilia (allegedly extending even to monarchism), his controversial position in American politics, and the resultant storm that his designation would raise precluded the New Yorker's nomination. After canvassing the other qualified envoys—John Adams, Chief Justice John Jay, and Jefferson among them—Washington bowed to Hamilton's insistence that "Mr. Jay is the only man in whose qualifications for success there would be thorough confidence." Although Jay's instructions were drawn up by Secretary of State Edmund Randolph, they incorporated some of Hamilton's suggestions (especially his insistence that those instructions be largely discretionary rather than narrowly prescriptive) but faithfully reflected the president's ideas. The American envoy was directed to persuade England to perform the unexecuted parts of the Anglo-American peace treaty of 1783, to secure indemnification for the capture and condemnation of American vessels, and to win acceptance of an Anglo-American commercial treaty. Jay was firmly instructed to sign no treaty that conflicted with American engagements to France or failed to give American ships entry to ports of the British West Indies. The outcome of the diplomatic mission by which Washington had successfully countered congressional bellicosity was now up to Jay and, more instrumentally, to Lord Grenville, the British foreign secretary. On 12 May 1794, Jay left for London, where month after month he sought concessions that Grenville only stingily allowed. While Jay was seeking to wrest from England respect for America's sovereign status and recognition of its rights as a neutral, the Washington administration was attempting to assure the supremacy of federal law against delinquent taxpayers. At issue was the excise on whiskey, authorized by a law of March 1791, which encountered strong opposition among distillers, especially in the westernmost counties of Pennsylvania. There in 1792 violence erupted, to which Washington reacted by issuing on 15 September a proclamation admonishing all citizens "to refrain and desist" from obstructing the enforcement of federal laws. For over a year and a half the Washington administration pursued a policy of pacification that seemed to allay active resistance to the excise, but beginning in the spring of 1794, news reached Philadelphia of discontent and occasional violence. By midsummer, these had been replaced by a systematic and popularly supported campaign to shut down operation of the federal revenue system in the disaffected area—or so it appeared to the president and his Treasury Department advisers. At a cabinet meeting on 2 August also attended by Pennsylvania's Governor Thomas Mifflin, Washington elicited advice on how to handle a seemingly imminent insurrection. The cabinet discussion was inconclusive, and Washington requested the conferees to submit written opinions. Hamilton called for the use of troops to quell what he unhesitatingly termed treason, a position endorsed by the attorney general and the secretary of war. Secretary of State Edmund Randolph and Mifflin dissented. The decision was up to the president. Aware that even as the cabinet deliberated, some five thousand dissidents, many of them armed, were assembling at Braddock's Field near Pittsburgh, Washington promptly made up his mind: the citizens of the western counties were not only flagrantly defying federal law that must be upheld but also contemplating an insurrection that must be countered by force. Before ordering the army to march west, Washington issued a proclamation commanding the insurgents to disperse and exhorting all inhabitants of the area to "prevent and suppress dangerous proceedings." He then awaited the report of commissioners that had been appointed to negotiate with the insurgents. By 9 September the president, despairing of an amicable settlement and worried that the season during which military operations were feasible was rapidly passing, approved orders for a general rendezvous of troops at Carlisle. Conscious of the prestige his presence would lend the punitive expedition, he decided personally to assume command of the expected fifteen thousand militiamen from Pennsylvania and the neighboring states of Maryland, New Jersey, and Virginia. Hamilton insisted on going along, rationalizing that since measures of his own department were the ostensible cause of the insurrection, it could not "but have good effect" for him to share in the "danger to his fellow citizens." On 30 September 1794 the president, with characteristic terseness, recorded in his diary, "I left the City of Philadelphia about half past ten o'clock this forenoon accompanied by Colo. Hamilton." Some hours after they left the capital city, they were overtaken by a messenger bearing an official packet for the president. It contained highly gratifying news from General Anthony Wayne, describing a series of stunning victories over the Indians in the Northwest. These had culminated on 20 August in Wayne's resounding triumph in the Battle of Fallen Timbers, a victory that opened up the Ohio country and diminished, although it did not destroy, Anglo-Canadian influence over Native Americans in that region. Encouraged that the far western frontier was for the time being strife-free, Washington could more resolutely turn his attention to armed resistance by westerners on the nearer frontier. On 4 October the presidential coach arrived in Carlisle, where the troops were beginning to assemble, and from there Washington journeyed westward to Fort Cumberland and then to Bedford, where all the militia would soon rendezvous. Having bestowed on the expedition the prestige of his personal presence, Washington returned to Philadelphia to deal with other pressing business. As his replacement as commander of the federal troops, he designated Governor Henry Lee of Virginia, whose instructions were prepared by Hamilton, who remained with the army to assist in the successful completion of the mission. Hamilton was no doubt delighted, but the advantages of his remaining were lost on virtually everyone except himself and the president. The treasury secretary's presence provided ammunition for Republican critics, who charged that the entire military mission had been arranged by him for personal political advantage. To Washington, whose confidence in Hamilton was by this time unalloyed, such a charge was nonsense; the president, rather, believed that the opposition to the western Pennsylvania expedition was fomented by his partisan opponents. Whether the latter belief was true or not, Washington's conviction that the expedition would serve actually and symbolically as a reminder of national supremacy was well placed; the militia encountered no armed opposition and even the extremists of the antitax movement were dissuaded from further active resistance to the excise. The dispatch of troops to enforce obedience to federal law was, moreover, a precedent of indeterminable, but certainly consequential, historical importance, as the history of southern school integration in the mid-twentieth century, among other later developments, would attest. Washington returned to Philadelphia in late October in expectation of delivering his sixth annual message to Congress, which was scheduled to assemble on 3 November. A quorum could not be counted until 18 November, and the president addressed Congress on the following day. Most of his twenty-five-minute address was given over to the background, immediate causes, and suppression of the so-called Whiskey Rebellion (more accurately, "Insurrection"). His comments on the then-mushrooming "democratic societies" or "Jacobin clubs," promoted for partisan ends by some prominent Republicans of the day, were far and away the most controversial part of his message. Washington spoke derogatorily of "certain self-created societies" and asked the people to determine whether the Whiskey Rebellion "had not been fomented by combinations of men who, careless of consequences and disregarding the unerring truth that those who rouse cannot always appease civil convulsions, have disseminated, from ignorance or perversion of facts, suspicions, jealousies, and accusations of the whole government?" Although in the context of succeeding presidential speeches Washington's remarks were innocuous enough, they created at that time strong reverberations throughout the country. It was the first time the nation's revered hero had spoken disparagingly in public of the political opposition. The effect was immediate: the democratic societies virtually disappeared, and those Republicans who had encouraged the societies were reduced to grumbling in private because they dared not confront the president openly. For his part, Washington presumably regretted having even implicitly chided his opponents—much less, as was privately thought by some critics at the time, having attempted to abridge freedom of speech and assembly. He never again publicly criticized his political opponents or even thus referred to them. Ignoring the opposition was probably easier than having to do without two of his most trusted advisers. On the last day of 1794, Henry Knox stepped down as secretary of war to try to salvage what he could from his imprudent land speculations. At the end of January 1795, Hamilton resigned as secretary of the treasury largely because he was no longer willing to oblige his family to live on his meager official income but also because he was weary of the calumnies heaped upon him and his policies. It was not easy to find officials of similar ability. But Oliver Wolcott, Jr., Hamilton's successor, had extensive experience as the second-ranking Treasury Department official and proved to be a competent finance minister. Timothy Pickering, Knox's replacement, was a professional civil servant with useful experience and proven resourcefulness in negotiations with Indian tribes, then the principal task of the War Department. Washington's principal problem in 1795 was the treaty that John Jay negotiated with Great Britain. Unhappily aware that he had been forced to bargain from a position of weakness, Jay believed that he had secured all that was then possible. Britain had promised to give up the northwestern posts by June 1796, to pay for the spoliations on American commerce, and to sign a commercial treaty granting the United States certain limited trading privileges with India and with the British West Indies. In return, Jay had renounced maritime principles that the United States had hitherto considered inviolable—the familiar insistence of neutral nations on freedom of the seas—and had instead accepted Great Britain's interpretation of international law. Although many of their respective countrymen did not see the matter that way, Jay and Lord Grenville, the British foreign secretary, had in fact worked out a quid pro quo based on a realistic assessment of the prevailing power situation. They were convinced, moreover, that the treaty was as important for the machinery it established for settling further disputes as for what it formally stipulated. To a good many Americans the true measure of Jay's Treaty was not its provisions but its omissions and shortcomings. The oversights that aroused the greatest furor were the absence of any offer of compensation for slaves freed by the British in 1783 and silence on the issue of impressment of bona fide American sailors by the English navy. The shortcomings most often lamented were Britain's refusal to grant the United States an unrestricted, rather than a partial, privilege of trading with the British West Indies and the stipulation that American ships would not carry molasses, sugar, coffee, cocoa, and cotton to any other part of the world. Soon after the treaty was delivered to the secretary of state in early March 1795, President Washington called for an emergency meeting of the Senate on 8 June, stipulating also that the provisions of the treaty should until then be kept secret. Over the next few months, Washington closely studied the document negotiated by Jay, particularly its commercial sections, of which he conceded that he needed a more "intimate" knowledge. Whether he acquired it, he kept to himself: when the Senate convened, he submitted the treaty without any opinion of his own. On 24 June, after two weeks of debate conducted in secret session, the Senate, by a vote of twenty to ten (precisely the constitutionally necessary two-thirds majority), advised him to ratify Jay's handiwork, on the condition that the clause restricting American trade with the British West Indies (article 12) be suspended, pending "further friendly negotiations." For Washington, such a condition posed a perplexing problem: Should he ratify promptly in confident expectation of excision or revision of that article, or should ratification await such changes? His decision was rendered more difficult by receipt of news that the British were again seizing American vessels bound for France. Despite his angry reaction to that report and his dissatisfaction at the high price exacted by England for agreeing to a limited rapprochement, Washington signed the treaty on 18 August 1795, in the face of fierce partisan opposition to it and his awareness that his still-glowing popularity might be greatly dimmed. The decision was in fact one of disinterested statecraft and was based on his clear perception of the new nation's diplomatic situation. The proper goal of its foreign policy, Washington believed, was avoidance of a war that America was unprepared to fight. Its primary need was not so much a particularly favorable treaty or even an advantageous foreign alliance but time—a long period of peace to develop America's resources, to diversify and expand its growing economy, to create a great common market, to cement a still shaky union, and in these ways to establish a powerful nation capable of challenging the war machines and naval strength of Europe's foremost powers. Washington's political opponents did not agree, and the protracted fight over Jay's Treaty was an important milestone in American political history. The conclusion reached in the 1950s by Joseph Charles is still generally accepted: "In its political effects [the treaty was] the most important measure . . . between the institution of Hamilton's financial program and the election of 1800." Not only did the controversy over Jay's Treaty signify the maturity of the country's first political parties, but it also occasioned fundamental shifts in partisan loyalties. An influential number of prominent public figures who had steadfastly supported the Washington administration now openly embraced the Republican opposition. This was tellingly displayed in the spring of 1796, when Republican leaders in the House of Representatives decided to abort implementation of the treaty. Their initial maneuver was adoption of a motion introduced by Edward Livingston of New York on 2 March 1796, requesting the president to submit to the House copies of Jay's instructions and related correspondence. Washington, convinced that such a request was unconstitutional, sought confirmation of his belief by consulting the highest-ranking government officials and the nation's foremost Federalist leader, Hamilton, who advised his former boss "to resist in totality" the congressional request. And so the president, courteously but emphatically, did. Washington's terse message to the House concluded, "A just regard to the Constitution and to the duty of my Office . . . forbids a compliance with your request." Aware of Washington's heroic standing among his countrymen, Republican leaders in Congress did not openly challenge the president's contention, but they obliquely retaliated by attempting to persuade their colleagues to withhold the necessary appropriation for carrying out key provisions of the treaty. During several weeks of intense debate it appeared that they might succeed. 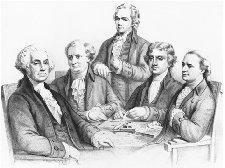 Federalist leaders, in and out of Congress, energetically sought some means of salvaging the treaty. Popular clamor and a deluge of protreaty petitions provided the way. A number of defections destroyed the hitherto united Republicans, and on 29 April the Speaker of the House broke a tie vote to approve an appropriation for carrying the treaty into effect. The episode was manifestly important for the enduring precedents that it established, particularly the exercise of executive privilege. As Washington saw the matter, the decision was a triumph for viable nationhood. The president could also congratulate himself that the concessions made to Great Britain in Jay's Treaty were compensated for by the conciliatory spirit displayed by Spain in the Treaty of San Loren-zo, negotiated by American envoy Thomas Pinckney in 1795. An impressive American diplomatic victory, that treaty gained for the United States acceptance at long last of its demand for free navigation of the Mississippi and the right of deposit at New Orleans free of duty for oceangoing American goods. Spain also recognized the Mississippi as the new nation's western boundary and the thirty-first parallel as the northern boundary of Florida. As Washington hoped it would, the treaty helped to cement the loyalty of westerners to the Union and opened the way to steady American expansion in the South and West. Support of Pinckney's successful negotiations was bipartisan, but Jay's Treaty remained a controversial partisan issue (although the furor it initially aroused abated), subtly affecting Washington's last two years in office. Following his endorsement of the latter treaty in August 1795, Washington was for the first time during his presidency subjected to personal abuse, not only on that but also on other issues. Typical were anonymous contributors to the Philadelphia Aurora, then the most fiercely partisan and scurrilous of Republican newspapers. One such writer dubbed the president "Saint Washington," a political leader distinguished merely by "the seclusion of a monk and the supercillious [ sic ] distance of a tyrant," and another chided him with the offer of a crown. Washington was most disturbed by the anonymous accusation that he was overdrawing his annual presidential allowance of $25,000. It would have been altogether out of character for Washington to have publicly replied to such attacks, but he did express his reaction in private correspondence, complaining that he was being compared to a Nero or even to a common pickpocket. After forty-five years of public service, he commented, he was weary of being "buffeted in the public prints by a set of infamous scribblers," and he now yearned for retirement. Partisan abuse did not prompt Washington to endorse the acceptability of political parties in the American constitutional system, much less to profess his allegiance to any party. On the contrary, he continued to caution his countrymen against "the baneful effects of the spirit of party," which, to use the words of his farewell address, "serves always to distract the public councils and enfeeble the public administration." Although Washington never thought of his administration as representing a party or of himself as a party leader, the facts were somewhat at variance. During his final years as president he appointed to office only those whose political ideas were in accord with his own. As he wrote a member of his cabinet, "I shall not, whilst I have the honour to administer the government, bring a man into any office of consequence knowingly, whose political tenets are adverse to the measures, which the general government is pursuing; for this, in my opinion, would be a sort of political suicide." So it was that Washington not only initiated a practice that would be permanent but also indirectly set an unintended precedent for which there was no constitutional warrant: the president's role as party leader. Although Washington denied that he was a party leader, he repeatedly affirmed presidential leadership in foreign affairs. During the final years of his administration, as throughout his presidency, diplomatic problems plagued him. The nation had weathered the tempest of Anglo-American relations of the years 1794–1796 only to find itself locked in conflict with France. Claiming that by Jay's Treaty the United States had allied itself with Great Britain and reneged on its treaty obligations to its Revolutionary War ally, the French began in 1796 a systematic policy of maritime harassment and diplomatic coercion designed to bring the allegedly ungrateful and unruly new nation into line. In July 1796, Washington, to appease domestic critics while also leaving the door open to friendly negotiations, designated Charles Cotesworth Pinckney of South Carolina as American minister to France, replacing James Monroe, whose ardent Francophilia had brought no moderation of French policy but had antagonized Federalist leaders. The futility of Pinckney's ministership would be demonstrated under the nation's second president. Happily aware that his successor would soon be chosen, Washington turned his attention to the form and timing of the announcement of his retirement. His first inclination was to use a modified version of a valedictory message that James Madison, at the president's request, had drawn up in September 1792. Tailoring his work to fit the heroic mold of the foremost American of his day, Madison had avoided controversial issues and focused instead on commonly cherished national sentiments, such as the perfection of the Constitution and the necessity of preserving the Union. Upon rereading Madison's draft some four years later, Washington concluded that it only needed to be updated in order to take into account the "considerable changes" that had subsequently taken place, particularly in foreign affairs. The president himself undertook the assignment, penning a terse supplement (actually a list of what he called "wishes"), which he merely tacked onto Madison's draft. The most perceptive student of the farewell address, Felix Gilbert, has described Washington's appendix as a "collection of diverse thoughts and ideas" that were "neither closely integrated nor systematically organized." Nevertheless, the views that he expressed faithfully reflected his current preoccupations and long-standing fundamental principles. Washington pointed to the personal indignities he had endured as chief magistrate, the lamentable party divisions and other domestic difficulties he had encountered, and the centrality of foreign policy problems that he had wrestled with during his second administration. Apropos of the last subject, Washington indicated the dangers to be confronted, the pitfalls to be avoided, and the proper policies to be followed. Among the dangers Washington warned against was foreign influence in American domestic affairs. The pitfalls he pointed to included avoidance of both political connections with other nations and the falseness of the notion that in international relations nations are guided by altruistic motives. The most important policies to be followed were fidelity to treaty commitments, pride in America's distinctive nationality, adherence to a policy of genuine neutrality, and preservation of the Union. At this point, Washington, as he had so often done, called on Hamilton for advice. The New Yorker was requested either to revise the rough draft of the valedictory address (essentially, Madison's original version plus Washington's addendum) or, if he considered it necessary, "to throw the whole into a different form." Hamilton did both, counting on the president to accept the New Yorker's declared preference for what he termed his own "Original Major Draft." Although about one-half of the latter was Hamilton's work (the rest was a paraphrase of the Madison-Washington essay), he included nothing that was at variance with Washington's ideas, on which Hamilton, because of long firsthand experience, was an authority. Thus, the most famous presidential valedictory message in American history, despite Hamilton's important contribution to it, has always been properly described as Washington's Farewell Address. It is still read in both the Senate and House of Representatives every 22 February, a tribute to its and the first president's enduring importance. The Constitution did not, of course, preclude a presidential third term (or virtual lifetime tenure for that matter) and many of Washington's supporters doubtless fantasized that he might run again. But constantly aware, as he complainingly put it, that he had spent "all the prime of his life in serving his country" and ever eager to return to the tranquillity of Mount Vernon, Washington never even fleetingly entertained the possibility of another term. He thus established the precedent that a president should relinquish office after two terms, a tradition that was not breached until Franklin D. Roosevelt's presidency and one that subsequently was institutionalized in the Twenty-second Amendment to the Constitution. Another outstanding feature of Washington's conduct during the election of 1796 was emphatically not copied by most of his successors: He resolved to play no role at all in the choice of his possible successor or in the ensuing campaign. He not only stuck to his resolve but also made no recorded statement on the election of the Federalist candidate John Adams as president and the Republican candidate Thomas Jefferson as vice president. On 4 March 1797, John Adams was sworn in as the second president of the United States. Among those seated alongside Adams on the elevated dais in Congress Hall was his presidential predecessor, who, attired in an old-fashioned black coat, was, much to the president-elect's chagrin, the center of attention. Characteristically composed, seemingly impassive, Washington was inwardly delighted to be relinquishing an office that he had neither sought nor ever really wanted. Adams understood. His inauguration, the new president wrote, was "a solemn scene . . . made affecting to me by the presence of the General, whose countenance was as serene and unclouded as the day. He seemed to enjoy a triumph over me. Methought I heard him say, 'Ay, I am fairly out and you fairly in! See, which of us will be happiest.' " Whatever Adams himself may have thought, Washington was certain that he would be. Following the inaugural ceremonies, the former president went to the Francis Hotel, where Adams was temporarily lodging. After congratulating his successor, Washington emerged to be greeted by the enthusiastic cheers of the throng that had assembled outside. The applause that rang out was symbolic of that which would be bestowed on him through proceeding decades. It's amazing you offer the comment, because i wanted you to know my reaction. Excellent article. As close as you can get to a truly objective view of a president. It provides names and dates, not delving into too many details but allowing for the reader to research individual topics discussed at his or her leisure.